We’ve been slow to get things hung on the walls around the new house, but a few things went up over the Presidents’ Day weekend, including medal racks. 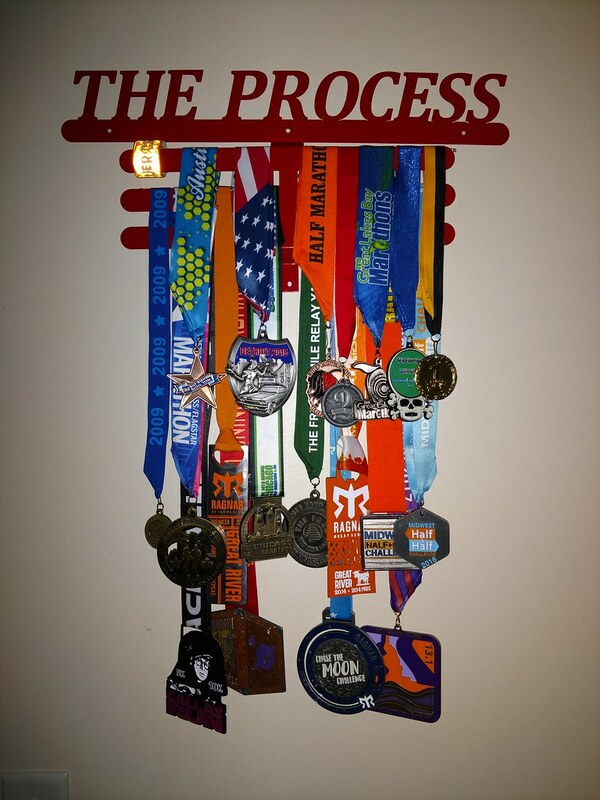 After a few years of running, it’s a challenge to display all the medals that I’ve earned. Finisher medals are very much a thing in running. They’ve grown more numerous and larger; I don’t think that’s either good or bad. It just is. I do enjoy seeing a first-time marathon finisher get a giant medal to help honor her/his accomplishment, so maybe the expanding size is a plus. Furthermore, many of them are aesthetically pleasing, and I enjoy them for their artistic value as much as I enjoy the fact that I’ve earned them all. Regardless, several years of medals create a display challenge, so I decided to select a few for display on one of the racks. Each of these medals represents a different, good day, and those days were good for different reasons. Let’s start with the bottom row. I don’t run a ton of virtual races, but I will, infrequently, sign up for one. Usually, if I’ve registered for one, it’s because a) the medal is related to something down my alley or b) the race supports a good cause (and often both). I’ve long insisted that Spaceballs is one of the best sci-fi movies ever made, and Dark Helmet is such an amazing character. My friends all known I’m very much a Whovian, and the War Doctor is one of my favorite incarnations of everyone’s favorite Time Lord. Those virtual runs both tied into personal interests, which I appreciate, as I’m more than just a guy who runs. That said, they both supported good causes, too. Yup, I said it. I think Spaceballs is, straight-up, a great movie. Sorry, not sorry. Second from the right on the bottom row is my medal from the Ragnar Chase the Moon Challenge. Had I not been paying attention, a couple of cyclists would have run me over that night. Fortunately, I was paying attention, and I lived to run another day. It was fun to be part of something that tied runners together from around the country. The last medal on the bottom row is from the 2017 Capital City River Run. That’s the most recent half marathon I did, and it was my first post-surgery half marathon. The left side of the second row includes a few firsts: from left to right, those are my first half marathon (Borgess Run, 2009), marathon (Detroit, 2009), overnight relay race (Ragnar Relay Great River, 2011), and half marathon with the person who would become my wife (Chicago, 2010). None of the race times were particularly noteworthy, but they were all noteworthy races for me. The fifth and sixth medals in that row are from perhaps the least intelligent (though still very rewarding) thing I have ever done: overnight relays run on consecutive weekends in August 2014. Wrapping up the middle row are my two finisher medals from the Midwest Half and Half Challenge, earned in 2015 and 2016 by running both the Wisconsin Half Marathon and the Borgess Run for the Health of It in the same weekend. The top row of medals includes medals from my personal bests in the half marathon and marathon. That marathon time was in the neighborhood of 3:45, which isn’t a particularly noteworthy time. The half marathon, though, was a more attractive 1:29:22 run on the streets of Austin, Texas, in January of 2015. To the right are medals from races in which I somehow managed to earn an age-group award: the 2014 Chief Ladiga Trail half marathon (second place), the 2015 Great Lakes Bay half marathon (first place), and the 2017 Screaming Banshee 5k (first place). The last one of the three was a rather hilarious outcome, in that I was actively working to keep my pace slow because of a lack of interest in getting hurt as I built up my distance in my return to running. That simply had to be the day I won my age group. The medals are nice. It’s good to take a moment to acknowledge a few of the successes, but the medal rack itself is intentionally designed to discourage me from resting on those laurels … in a very Alabama way. At his introductory remarks in Tuscaloosa after taking over as Alabama’s football coach, Saban said, “We’re not going to talk about what we’re going to accomplish. We’re going to talk about how we’re going to do it.” I try very much to let that guide my race training. I can’t spend all my time thinking about the races for which I’ve registered; instead, I need to worry about what I have on my training schedule today, and applying myself to that training schedule, to watching my calorie intake, and the like. I’ve got a second medal rack on the wall. It has a place for bibs and other memorabilia, which is why I bought it. It also has a place for medals, but I deliberately left it empty. I haven’t yet accomplished anything in 2018, so I don’t have any medals placed there. Perhaps I will earn a few this year, but I have a lot of work to do before that becomes a possibility.